Just one of the advantages of being a member/owner of a cooperative is sharing in its success. Consolidated Telecommunications is proud to provide its member-owners with affordable rates. Your cooperative is equally proud to have returned to its members, over the years in the form of capital credits. CTC is a cooperative, owned by its members so it does not necessarily earn profits. Instead, if revenues exceed the cost of doing business (expenses), the co-op has earned “margins” (profits). Each year, margins earned are assigned to members in proportion to the amount paid during that year… these are capital credits. Capital Credits can also be allocated in offering new and upgraded telecommunication services. What is the difference between an allocation and a retirement? Each year your portion, of any margins that CTC may have are, “allocated” or assigned. When the board decides to “retire” those allocations is when you get your money. Then how are my capital credit allocations used until they are retired to me? That money is used for operating capital. It reduces the need for your co-op to borrow money. 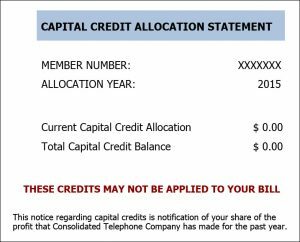 Do I need to be a member for a certain amount of time before I am eligible to receive capital credits? No. As soon as you become a member you are eligible. Can I use my allocation against my bill? No, the allocation is an assignment; the board must vote on the retirement of that money. If the Board decides not to retire capital credits do I lose my money? No, it is still assigned to you to be retired at a later date. In order to keep our costs low the cooperative runs as tightly as possible. The cost to upgrade our network is rising, weather related problems all can play into the cooperatives costs. Is interest paid on capital credits? What happens to my money if I leave CTC? The money allocated to you during your membership will be sent to you as it is retired. It is the member’s responsibility to keep the cooperative informed of address changes. What if I should die before they are retired? The Cooperative requires proof that you are the legal recipient of the deceased estate. You must show all the documents stating you are the heir and sign a claim form.